Happy Homecoming Week! Check out the the Sweet Happenings in your Media Center! We are here to support ALL of your research and project-based learning activities! Click here for more information! Would you like to make a purchase recommendation for the MC? We are in the process of ordering books, DVDs, and magazines for the MC. Please let us know if you have suggested selections. Please note that we do not purchase classroom book sets. This week is Teen Read Week. 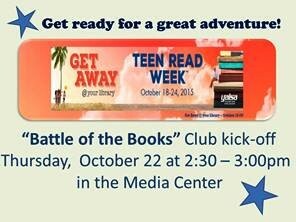 We are having our 1st Book Club meeting on Thursday, 10/22 to kick-off the HS Battle of the Books. We will feature our very own award-winning author and Social Studies teacher, Ms. Michele A. Bowen for our kick-off event. Ms. Bowen is the author of 6 books, including Church Folks, an Essence Magazine Bestseller. Please drop by to hear some inspiring words from Ms. Bowen! Feel free to recommend students for our history-making HS Battle of the Books event! We make connections at every PD opportunity. At the last NCTIES conference, we connected with a wonderful educator! Rushton Hurley (pictured with us! ), our West Coast connection, is the founder of NextVista for Learning. Next Vista For Learning provides a library of over 1000 free videos made by and for teachers and students everywhere. There are projects, contests, and tons of digital media resources for your classroom. Check out http://nextvista.org today! Check out World Book Online! This trial is valid until November 1, 2015. Remember that we have a regular subscription until the end of time (or until DPS decides to stop funding it)! Have you visited the DPS Media & Technology page on the DPS Central website? Click here to access this page. DPS Media & Technology is focused on assisting teachers and students to understand and make learning connections to the North Carolina Information and Technology Essential Standards (ITES). The ITES are designed to be seamlessly integrated into all curricular areas and grade levels through collaboration among teachers, media specialists (or coordinators....that's us!) and technology facilitators (that's us, too!). As a result, Information and Technology skills are taught in context, and instruction occurs in classrooms, media centers, technology labs and virtual settings. Printing Images for a Project? Try this resource! Remote password for NCWiseOwl is wiseowl15. We have 2 Chrome Book mobile labs. One will be placed in a hall or department. The other lab will circulate via your MC. Chrome Books only allow DPS Gmail login and the use of DPS Google applications. Please come by to see how the Chrome Books work! Stop by the media center about the check out process. Professional Development opportunities just for YOU!! We will have another Brightlink professional development opportunity in November (date TBD). This session will focus on using the ActivInspire software (that is is already loaded on your computer). You can check out more information about using your Brightlink here. Activate your software using the passcode and serial number located here.